Which packaging solution is right for your business? Are you new to packaging and unsure about your options? Or are you hand-packing mailers and ready for the next level? Maybe you’re growing rapidly and ready to bring in an automated solution. Exploring all your packaging solutions, at every stage of shipping, is equally as important as the product you put into the package. As e-commerce rises, it’s well-known that material quality, printing superiority, branding and logo placement, and recyclability, are important consumer baseline standards. Proper packaging will include these elements every time. Company standards are also essential, as packaging needs to be cost effective for your business, meet potential regulations, transport easily and store efficiently, too. Perhaps most obvious, your packaging solution needs to physically fit your product so that you don’t end up paying more than necessary in shipping. Covering packaging basics is just as important as deciding the right solution and process for your business. There are several directions to explore. Most small e-commerce businesses start out with hand-packing mailers as the first step in their packaging evolution. However, businesses at every stage use hand-packing. Mailers are the ideal solution for both fragile and non-fragile items. They decrease shipping DIM weight costs by downsizing from bulky boxes. They are also customizable, ultra-tough and lightweight, and fit a variety of products. The benefit of hand-packing mailers is that, first and foremost, it can be the most inexpensive solution for a smaller business, as many businesses cannot afford to invest in equipment to speed up shipping in the beginning. Manual packing is a common process in packaging and has been around for years. Mailers have been perfected to aid in challenges presented by the practice. For example, PAC has created anti-static release liner so manual packers can fill and seal more packages without liners sticking to clothing and cluttering their workspace. Manual hand-packing is a great solution at any stage, but there are other solutions to consider, too. E-commerce businesses fulfilling hundreds-to-thousands of orders need a work station fit for high output and ease of use. Wicketted Bags have been created and used for both purposes. The bags can increase throughput speeds over 20% by freeing up one hand for packers to easily insert products into mailers. They can also be vertically mounted onto a workstation, or even placed on wicket stands, freeing up valuable space for your packer to operate without clutter. Wicketted Bags are ideal for less fragile shipments such as clothing, soft goods, documents, parts, soft toys, pharmaceuticals and shoes. If your business requires a bubble mailer solution and has reached the need for high-volume fulfillment, an automated solution may be the perfect option. Automated solutions are the ultimate in packaging. Not only are they the most efficient way to fulfill orders, but they decrease labor costs, and produce a high quality seal around your products for greater security. 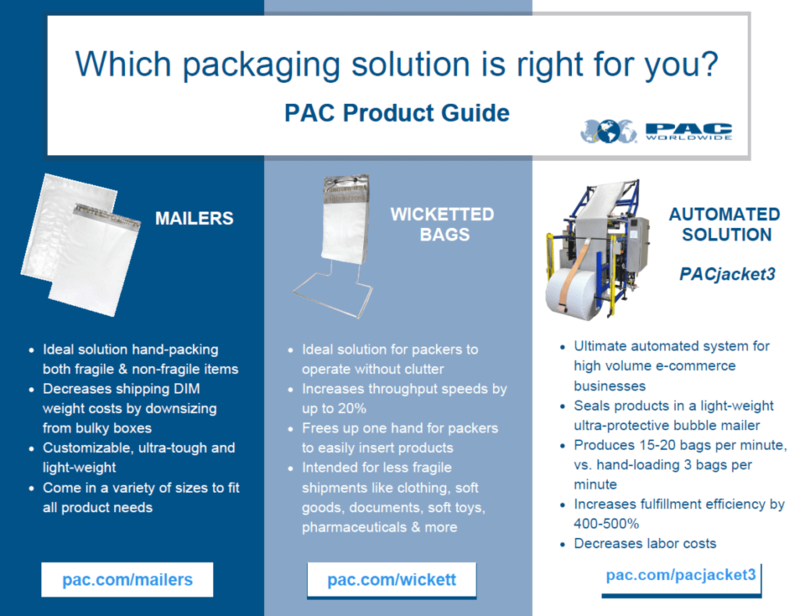 On average, PAC’s PACjacket3 machine produces 15-20 bags per minute using protective bubble film. By comparison, a person hand-packing and sealing puts out an average of 3 bags per minute! The machine increases fulfillment efficiency by 400 to 500%. Although there are innumerable benefits that come with an automated solution, your business must have the output and capital capable of making the machine worth your investment. An ideal solution at any stage of business, automated solutions are only a great fit for those that are ready for its production. A little education in packaging process and solution can enlighten businesses, giving growth trajectory a map. It’s important to discover the packaging solutions available as you evolve your e-commerce planning. PAC products are a great solution at any stage. Discover how our products can help or talk to an expert about your packaging needs.